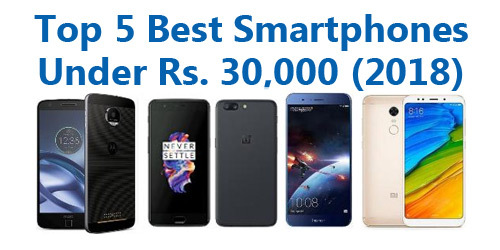 The category of mobile phones under Rs 30,000 is tricky as the devices are neither flagship nor are they entry level products. In this range, you can get phones which are almost flagship with only a few technical differences from the flagship devices. The entry of Chinese companies has made this segment very competitive similar to all other mobile categories. Let us look at some of the best mobile phones under Rs 30,000 in India. While we are talking about almost flagship, a recent price cut has brought the Xiaomi’s flagship in under Rs 30,000 category. With the Mi Mix 2, you get an all-screen smartphone with a stunning design. The device is powered by Qualcomm Snapdragon 835 which was the fastest available processor in 2017. It is supported by 6 GB of RAM and 128 GB of storage making it a power-packed device. The camera is good along with a decent software package. The Xiaomi Mi Mix 2 is priced at Rs 29,999. The Finnish firm HMD has delivered some of the best phones under the Nokia brand. Nokia 8 brings flagship in the affordable range with this beautifully designed and power-packed phone. It has a 5.3-inch display with 2.5D Corning Gorilla Glass 5. Under the hood, it is powered by a 2.5GHz octa-core Qualcomm Snapdragon 835 processor along with 4 GB RAM and 64 GB of inbuilt storage. It is packed with powerful dual 13 MP+ 13MP cameras on the rear and single 13 MP camera on the front. The black-copper variant is priced at Rs 25,999, whereas the tempered Blue can be bought for Rs 31,500. Honor, a sub-brand of Huawei is the new kid on the block that is making waves and unsettling many others in the process. Honor is quickly becoming the go-to brand for purchasing mobile phones under Rs 30,000 in India. The View 10 comes with a 5.99-inch full HD display,6 GB of RAM, 128 GB built-in storage, and 3,750 mAH battery. Honor phones run on Kirin processors, and the View 10 is no different. You get 20MP+16MP dual camera on the rear which is powered by AI, whereas on the front there is a 13 MP shooter. The Honor View 10 is available for Rs 29,999. Samsung is currently the top smartphone brand in India and it has achieved this feat by launching multiple phones in all segments. The A8 saw a recent price cut making it one of the best offering by Samsung in the under Rs 30,000 segment. With the Samsung Galaxy A8, you get a 6-inch AMOLED screen, Exynos 7885 Octa processor, 6GB of RAM, and 64 GB built-in storage. It comes with a single 16 MP rear camera, but dual 16 MP+ 8MP front cameras. The phone has received IP 68 rating, so you don’t have to worry about dust and water splashes. Launched at a direct competitor of the OnePlus 6, the Asus Zenfone 5Z has managed to find its own place in the segment. The base model comes with Snapdragon 845 SoC processor capable of clocking 2.8 GHz. Add the 6GB of RAM, and you get a seamless and lag-free performance. There is a dual camera setup of 12MP + 8MP on the rear and an 8MP camera on the front. While the pixel may sound less as compared to the Chinese counterparts, the picture quality is quite good due to added features. The 6.2-inch screen gives you a 90% Screen-to-body ratio. The base variant of the Asus Zenfone 5Z is priced at Rs 29,999.